Product code: P836 Categories: Sold Items, Sold Rings. Sometimes you come across an antique ring that has all the charm of yesteryear and a time gone by, yet still being able to maintain a modern look about it and be able to be worn with other antique rings as well as modern rings and blend right in such as this very attractive antique diamond set buckle ring that was made in 1900. Made in 18ct yellow gold, this antique ring is made with a buckle motif and set with a 0.08 carat diamond. 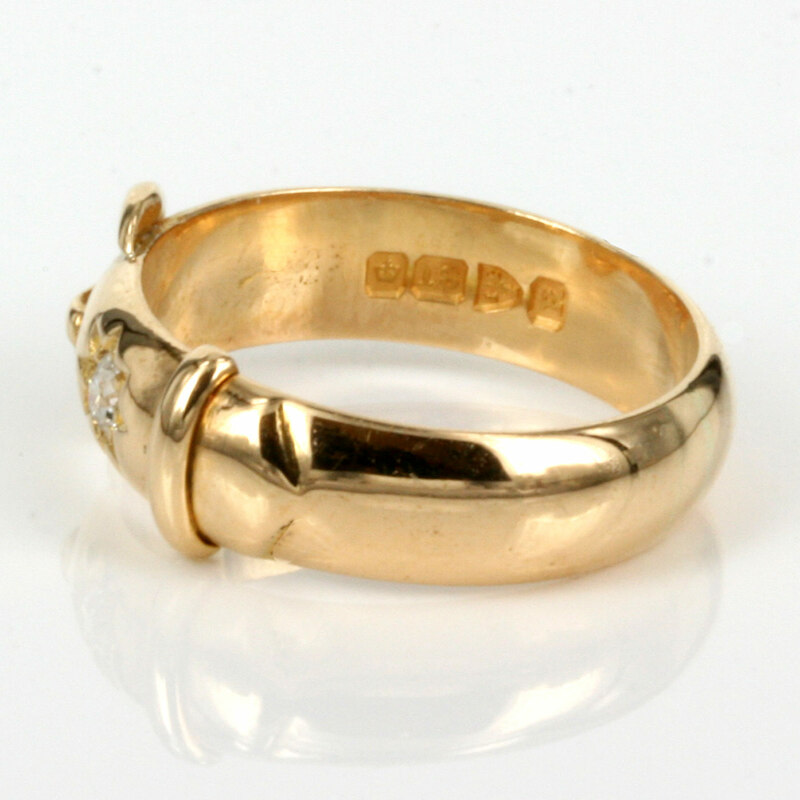 The high polish of the gold looks so good and the diamond is set in what is referred to as a “gypsy” setting where the diamond is set into the band as well as having the star pattern around the diamond. Measuring 8.4mm wide at its widest part where the “buckle” is, the band of the ring is 5.9mm wide and sits so well on the finger. 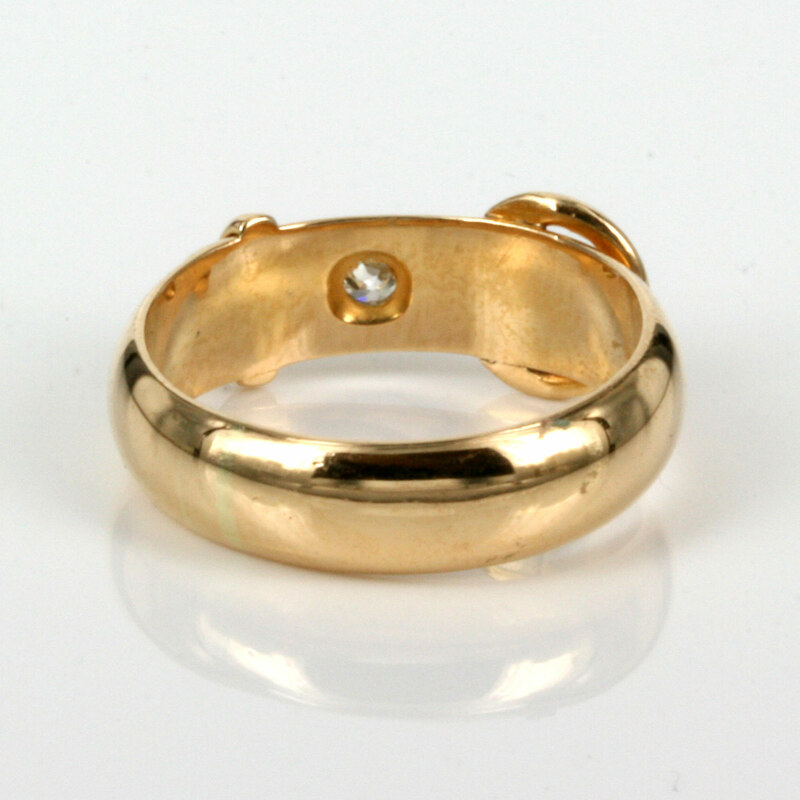 This is such a practical and versatile antique ring that is so easy to wear on a daily basis and always look so elegant and refined and the rich colour of the yellow gold with the sparkle of the diamond as well as the design all go to make this a very elegant antique diamond ring to wear all the time day or night.